In visual cortex, the gain of neuronal responses can be modulated by a wide range of factors including basic characteristics of sensory stimuli, such as the contrast of a visual stimulus, and cognitive processes such as attention. We seek to examine different forms of gain modulation observed in vivo, uncover the biophysical mechanisms that underlie these different forms and determine how cortical circuitry implements these mechanisms. The effects of attention, for example, have been described as a modulation of response gain, in which neuronal responses are multiplicatively scaled by a constant factor [1–3]. Figure 1A and 1B demonstrate response-gain modulation of neuronal intensity curves (firing rate vs. stimulus intensity) and tuning curves, respectively. Other studies describe attentional effects as modulation of contrast gain [4–6], in which attention appears to divisively scale stimulus contrast. We refer to this latter form as "input-gain modulation," and show examples in Figure 2A and 2B. We study the responses of a single-compartment spiking model neuron. In Figure 1 (panels C and D), the model neuron receives noisy excitatory and inhibitory synaptic input arising from "pooled" (as proposed by the "normalization model" ) local cortical activity. 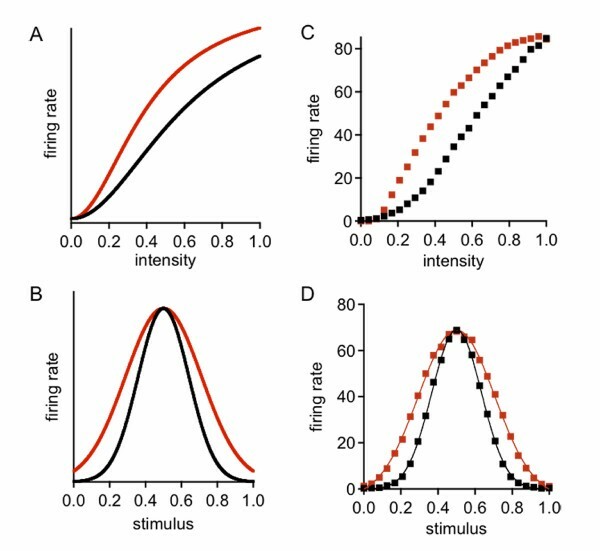 Increasing pooled activity, as might occur from adding additional visual stimuli or changing the attentional state of the animal, led to divisive response-gain modulation of neuronal intensity curves (firing rate vs. stimulus intensity) in Figure 1C and also neuronal tuning curves (firing rate vs. stimulus parameter) in Figure 1D. 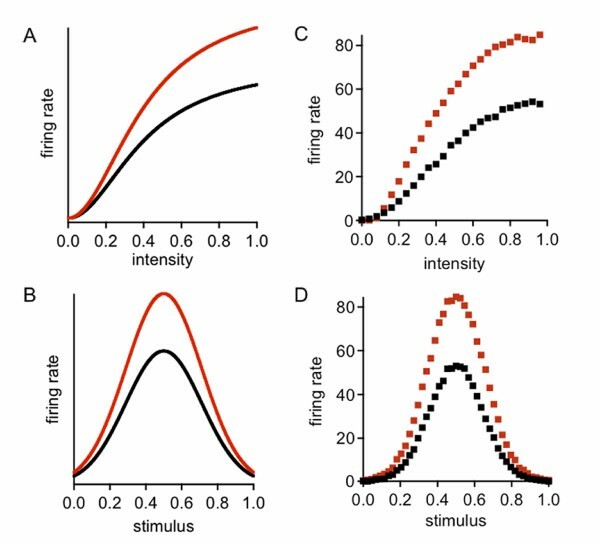 When the cortical architecture is modified to include mutual interactions between cortical pools, the effects of increasing modulatory input on intensity curves (Figure 2C) and tuning curves (Figure 2D) is more like input-gain modulation. Thus, both forms of gain modulation observed in vivo can be generated by noisy synaptic input, provided the associated cortical circuitry is configured properly.